Boat Shipping Preparation Guide from Planning to Delivery. 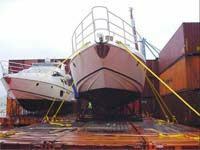 Call to discuss your boat and yacht transport preparation. Take the time to plan for your boat move. Proper preparation of your boat for transport requires careful planning and attention to detail on both the part of the owner and Boat and Yacht Transport. Proper preparation of the boat for transport is the responsibility of the owner. Boat Transport companies do not typically prepare boats for transport. 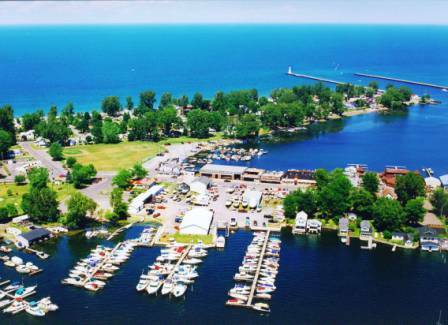 Marinas and boat yards personnel prepare boats and yachts for transport and typically will only allow their employees to prepare boats while on their property. 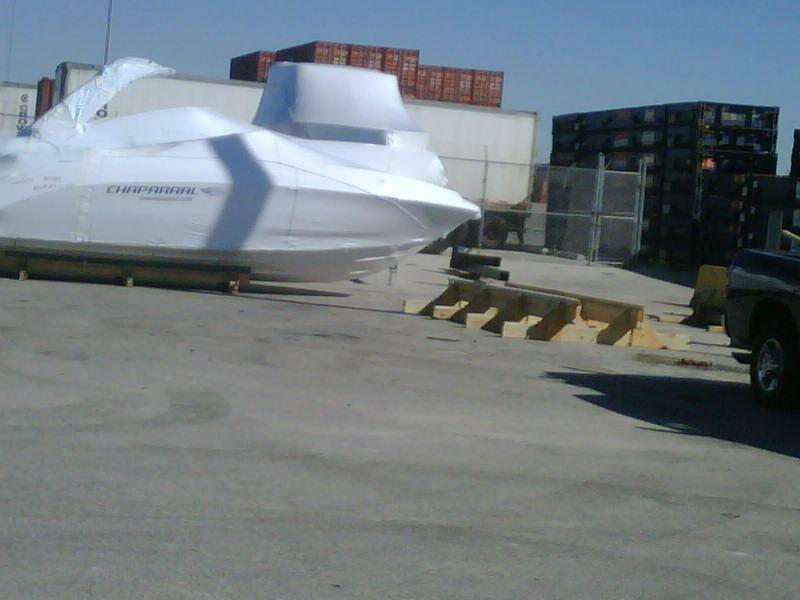 Choose a Professional Boat and Yacht Transport Company experienced in moving your type of boat. A successful boat transport company and their drivers must have combined experience working with DOT, permit agencies, marinas, boat yards, and ports to offers better savings to you by avoiding costly delays. Drivers are instructed not to move the load in any circumstance they regard as unsafe. At the sole discretion of the driver, he may decline to accept any load which he believes to be inherently unsafe for any reason. Our experienced, dedicated drivers have the knowledge and driving skills to transport your boat safely and professionally. 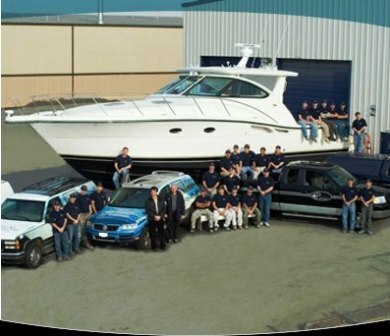 They are all highly trained and experienced at transporting over width and over height boats nationwide. It is critical to the safety of your boat to be sure oversized yachts being moved use the required escorts and high poles when state regulations require them. Professional boat hauling and yacht transporting drivers know how the boat must be supported, balanced, stabilized and secured. They know how to properly distribute the weight on both the boat, and the trailer axels and how to correctly secure the boat to the trailer. The dispatcher must match the right boat trailer and driver for the proper transport of your boat. The driver will complete a thorough condition check of your boat prior to loading and again at offloading. ● Having the boat ready to load when the truck arrives at its scheduled time. Besides having to pay the driver for unnecessary delay, this also causes our driver to get behind on the other boats we have scheduled for transport. Our boat transport drivers do their best to deliver the boat at the estimated time. However, this is an approximation only due to the many factors beyond their control such as weather, traffic, permitted re-routes, and availability of marina operations for loading and offloading schedules. ● Your participation and cooperation to prepare your boat for a safe transport as outlined in this document. ● Boat transport preparation done by an experienced boat yard. We recommend for boats 30 feet and up, the preparation be supervised or inspected by a licensed marine surveyor (see below for How to Prepare for a Marine Survey). ● Your understanding that transporters will not be responsible for damage to or caused from improper preparation or loading by the shipper for faulty or defective cradles, trailers, chains, binders, or other equipment provided by the shipper to secure the cargo. This includes anything that shakes loose, becomes unattached, drops, falls or breaks. Bear in mind these are not the result of driver negligence but are due to road vibration and high winds that are a normal part of boat transport and would happen no matter who was transporting your boat. ● your consideration that if your boat is being moved at 60 miles per hour into a 14 mile per hour head wind, it is experiencing hurricane force conditions, as well as any inclement weather that may be encountered en-route. Please expect normal road dirt on the boat. 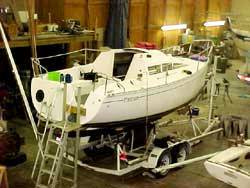 MEASURING YOUR BOAT FOR TRANSPORT: When requesting a quote to transport your boat, the dimensions are extremely important. 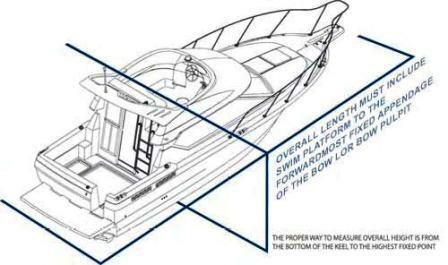 Please follow these guidelines for measuring your boat accurately. In order to transport your boat for the lowest possible price, we try to carry more than one small boat going in the same general direction at the same time. That is why it is important for the Boat and Yacht Transport to know the full overall length of your vessel in order to know what boats will fit on our trailers. OVERALL HEIGHT: The maximum height of many overpasses is 13 feet 6 inches. Many oversized yachts require wide-belly low-boy trailers in order for the keel to set down low. Using these type trailers for tall yachts can sometimes be low enough to avoid using a pole car if the boat loaded is less than the state-by-state height restraint (the New England area has many low bridges and re-routes may be dictated by the Department of Transportation. Boats with an overall height greater than 13.6’ loaded on the trailer require special handling and routing. It is critical to measure from the bottom of the keel to the highest non-removable part of the boat. The draft (from the waterline to the bottom of the keel) + clearance (from the waterline to the highest part of the vessel) equal the total standing height. Pending on your model, if the fly or command bridge may need to be removed. It is important to measure the vessel without the bridge and also provide bridge dimensions to ensure appropriate transport space. Remember measure twice – cut once!!! The bridge should be placed somewhere suitable on the boat and make certain it is safely secured. If it must be placed on the trailer, a frame should be prepared for it to rest upon. If your radar arch is removed, it should be secured against your boat. You might consider using carpet to protect areas where surfaces may "touch". Electronics such as radios, Loran Systems, etc., should be shipped separately or securely stowed in your cabin, with all cabin doors, windows, and any other access, locked. ● Do they have a travel lift or fork lift to load or offload your boat? ● If necessary, can they shrinkwrap or cradle your boat for international transport? ● Do they have a service bay for disassembly or reassembly of the radar arch or fly/command bridge? ● Can they assist with the preparation of the boat for transport? ● Does the facility have enough overhead clearance, free from low-lying trees and branches? HOW PAYMENT TYPICALLY WORKS: Understand how payment is to be made for both the boat transport service and the marina loading/offloading or providing preparation service to your boat is going to work. Typically, once a rate to transport is agreed upon, a deposit payable to Boat and Yacht Transport company is taken to secure booking, boat coordination fee, and in some cases permits and escorts. Prior to delivery the full balance is due via wire transfer to Boat and Yacht Transport. Your paid receipt and final Bill of Lading will be emailed to you direct just after delivery. The driver will prepare a BOL condition report upon loading and again at offloading, noting any obvious damage which you or your designated Agent will be asked to sign before the driver leaves. If there is damage to your boat, the freight must still be paid in order to file a claim with the insurance company. Marinas and boatyards expect to be paid for their services before they will release your vessel. Please be sure to settle your bill with them before the transport is scheduled to arrive so there is no delay in loading and releasing your boat. IT IS IMPORTANT TO REMOVE AND PROPERLY STORE THESE ITEMS - WHEN IN DOUBT...PULL IT OUT!!! This includes valuables, all exterior electronics, Anchors, Antennas, Propellers, Flagstaffs, Outriggers, any item that extends beyond the stated length, width or height of your vessel, all canvas, screens, cushions, and weatherboards, radar transmitters, hailers, and dinghies. Check the drain plugs. There should not be any water in the bilge while it is being transported. Drain fuel and water tanks as much as possible. Be sure the tank is no more than ¼ full. During winter months, water should be drained from water systems, pumps, and air conditioners. The batteries should be disconnected and the cables tied off to prevent contact. If engine hatch covers are battery operated, they should be secured to prevent their opening while in transit. Check for any loose items or items that could become loose. INSIDE YOUR BOAT: All items in the interior cabin should be carefully inspected to make sure they are battened down securely, including hatches. All locker doors should be well secured and locked. All items on deck should be securely lashed down. Normally the driver won't have a key, so any loose items will cause damage. We recommend, you lock the cabin and YOU keep the key. OUTSIDE YOUR BOAT: All electronics, radar, radar arches, hailers, horns, antennas, propellers, flag masts, lights, anchor lights, windshields, etc., must be removed, packed securely and securely stored below. The carrier will not be responsible if they are damaged or if they vibrate off. HATCHES: Hatches should be tightly secured and sealed with tape to prevent damage from wind-driven water. The latches should also be taped securely to prevent the hatch from coming open while in transit and to prevent damage to the boat caused by rain water thru a missing or leaking hatch or deck. A boat will not sit in the same position on the carrier's trailer as it does in the water. WINDOWS & WINDSHIELDS: Cabin windows should be latched and taped from the outside. All windshields and/or Plexiglas that protrude over the flying bridge should be removed, packed with a cargo blanket and should be well secured below. 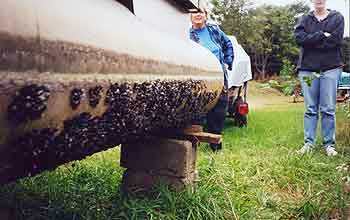 ZEBRA MUSSELS: If you are moving your boat from an infected State, thoroughly inspect your boat. Check engine intake strainers, and all other through-hull fittings. Check drain scuppers, out-drives and all possible areas of attachment. DOT officers are checking boats for Zebra mussels at weigh stations. If zebra mussels are found, your boat will be seized. 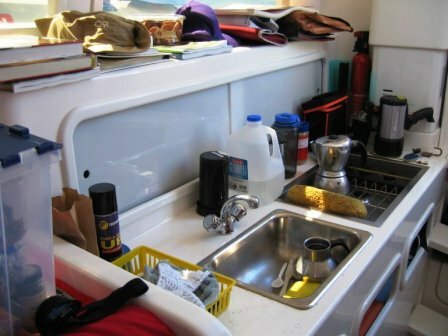 You will have to arrange for hot water removal, and you may also be required to have your boat launched first in salt water if your intended destination was fresh water. COVERS:Canvas covers, or loose cushion, grill, deck chair, or hatch door, etc., can be damaged, or do considerable damage, flapping or banging around loose in/with the forced winds and truck movements, which may be even more greatly magnified, if added to any naturally occurring winds, and/or other weather conditions encountered during transport. Canvas covers must be removed as they will tear or fly off during transport. SHRINKWRAP: Please see our guides for when to shrink-wrap your vessel. Shrinkwrap on oversize yacht transport can protect the boat from road tar and dirt. We DO RECOMMEND a good wash down at delivery. Shrinkwrap can tear or fly-off during transit. Our drivers carry tape, and will try to repair it if possible. If they can't, they will have to remove it. Keep in mind that the driver's view is often obstructed, and at night he can't always see that the shrink-wrap has torn. Nor can the driver hear the shrink-wrap flapping or "wind-milling." They are not responsible for damage caused by shrink-wrap, canvas covering or any other cover. In some cases, you may be charged for our driver’s time to remove the Shrinkwrap. Shrinkwrap is recommended for international boat and trailer shipping. While it is not necessary it is a good deterrent for break-ins and provides some base security. WOOD BOATS: It is highly recommended that wood boats be transported on their own custom cradle. This is suggested because there may be inherent structural weaknesses that are not readily visible or detectable. A well designed cradle will spread the weight of the boat over a much wider contact area. 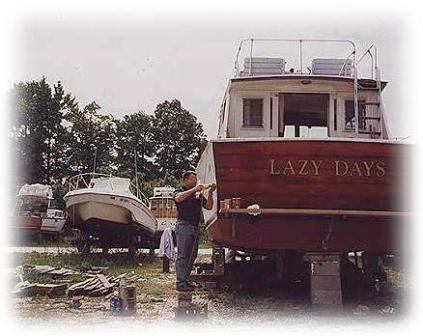 Wooden boats can be expected to dry out. A coat of linseed oil will help. Most boat transport companies will ask you to sign a release of liability for wood boats. DINGHIES: Dinghies can not be transported on its davits. The dinghy should be stored in the cabin or securely lashed and padded in the cockpit. If you are shipping a dinghy on board or if you have had to remove any superstructure, these items should be well padded. DO NOT leave dinghy on davits. POWER BOAT TRANSPORTING ADDITIONAL INSTRUCTIONS: Make certain that your windshield is strong enough to withstand the rigors and wind of travel. Confirm the seal is tight and screws holding it in place are not corroded. In some cases, oversize yachts are hauled backwards creating an even greater force of wind pressure. When in the least doubt ... REMOVE and SAFELY SECURE IT. Please NOTE: If not removed ... frameless Plexiglas windshields WILL BREAK!!! Take precautionary measures!!! Any inboard/outboard or outboard motors should be raised and locked. It is sometimes prudent to place a 2 x 4 securely between your out-drive and bracket. Whenever possible, you should consider removing the props and safely storing them. SAIL BOAT TRANSPORTING ADDITIONAL INSTRUCTIONS: Make certain that all Mast Poles are un-stepped and de-rigged. All cables and spreaders should be bound to the pole. 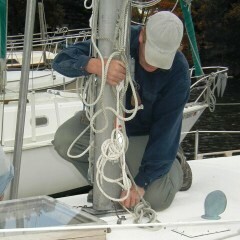 ALL rigging, winches, wind indicators, and lights must be removed from the mast. The strongest side of the mast should be left "clean" to rest on our trailer. Wrapping of poles is optional, but should be considered. Carpet should be provided for the mast at the points of tie down. Expect some chafing at these points. If the mast is painted, it is almost impossible to keep the paint from chafing. The carrier will not pa y to repaint masts if chafing occurs. Do not secure the mast to the boat, as there is a space on the carrier’s trailer for the mast. Should the mast be secured to the boat, the carrier will not be responsible for any resulting damage to the mast or the boat. Life lines, stanchions, bow and stern pulpits should be removed if they render the boat over height. On center board sailboats, make sure the board is secured and will stay up in transit. Keel sailboats may expect some separation where the keel joins the hull. This is not structural damage, but rather is the paint or filler cracking at the joint. Light built or racing sailboats can expect some hull indentation from the support pads. These indentations generally disappear when the boat is returned to the water. Ro/Ro (Roll-on / Roll-off): This requires your boat to be on its own trailer, or a trailer provided by the ship line. The cargo moves as one piece on a specialized trailer from port to port. Enclosed Container: Most liner vessels around the world today are full container vessels. If your boat fits the dimensions of a standard container (40' long, 7'8" wide and 7'10" high). These vessels are perfect for cargo that fits neatly into a standard 20'or 40' container. Flat Rack: This option is typically used for oversized boat. A cradle is built to support the vessel. A flat rack and strap is used to secure your boat to the vessel. We recommend shrink wrapping the boat to protect if from damage or debris getting into your boat during its international shipment. When shipping an oversized boat, we recommend that the manufacturer will disassemble certain parts from the boat such as engines in smaller boats, upper cockpits, bimini top, etc. Ship lines are on a first-come/first serve booking system and estimate the ship sail schedule and delivery. The timeframes given are estimations and not guaranteed schedules. CRADLES/TRAILERS: If you have a cradle for transporting your boat, please inspect it carefully for fit, loose bolts, strength and structural integrity. If your cradle breaks in transit, causing damage to your boat, the carrier cannot accept responsibility. They will not assume liability for any damage that results from the failure of your boat's cradle. If you are shipping your boat overseas, it is critical to use a knowledgeable, experienced agent well versed in overseas and international requirements. HOW TO INSPECT YOUR TRAILER FOR ROADWORTHY TRANSPORT: Check tires for wear, dry rot and proper tire inflation pressure and be sure the tread is sufficient and that there are no cracks, bubbles or gouges in the rubber. If the tires are dry rotted, replace them. Old tires are tired, so replace them and avoid a costly and dangerous blowout. A spare tire is required. Remove wheels and hubs; inspect hubs for wear and rough surfaces, turn drums if necessary. Service or replace the wheel bearings. Many breakdowns occur due to neglect in this area. If the bearings have not been maintained on a strict schedule or it has been more than 6 months since they were last checked, please have this professionally done. Travel builds up tremendous heat in bearings that have not been properly maintained, easily causing their failure. Bearings exposed to salt water are especially vulnerable. Remove bearings; inspect bearings 7 races for wear. If you replace bearings, also replace races and seals. If bearings are OK, repack and install new seals. Trailers with surge breaks: inspect brakes and hubs for wear, replace brakes and turn hubs if necessary, also check brake fluid level. Check springs, shackles and bushings for wear and corrosion, replace as necessary. Remember, salt water will destroy trailer wheels, springs and axels if not properly rinsed after each use in salt water. Check all lights, plug must be in good condition, turn signals and brake lights must work properly, all marker lights must work properly, repair or replace as necessary. Check the lighting system for proper operation and make sure wires are in good condition. If repairs need to be made, have them done well in advance of the pickup date. This work should be done by a professional or someone very knowledgeable on trailers. Please take the time to make your trailer TRULY ROADWORTHY. It is much more expensive if you break down on the Interstate. 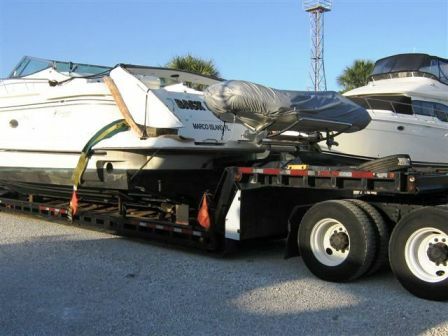 Boat and Yacht Transport Company cannot be responsible for your trailer if it is not in excellent condition. Pease do not ask them to transport a boat on a trailer that is not fit for travel. They cannot afford to jeopardize their safety or equipment, or your boat. You will be responsible for any repairs, damage or problems caused by your trailer. Unnecessary breakdowns are far more costly than routine maintenance. HOW TO PREPARE FOR A MARINE SURVEY: Time and additional expense can be saved by preparing the vessel for inspection and making her more accessible. Written authorization from the owner may be needed to board and/or to remove part of the vessel the vessel. Once you retain the Surveyor, he or she works only for you and reports to no one else. The Surveyor is there to protect your interest. Marine Yacht Surveying does NOT "pass" or "fail" vessels. The findings are reported, basic recommendations are given, and an opinion as to the "Fair Market Value" of the vessel is stated. As a buyer only you can determine whether the vessel meets your requirements based on our report. Marine Yacht Surveying does NOT make insurance or financing decisions. The surveyor reports observations which insurance or financing companies take into consideration to arrive at their decisions. ● A detailed description of the yacht and its systems. ● Recommendations regarding safety, necessary repairs and maintenance. ● Estimated current fair market value of the vessel. ● Photographs of the vessel and any unusual features or problems. Boat and Yacht Transport Inc. | Boat Transport Inc.